Split is a decently creepy horror film from M. Night Shyamalan with an overblown twist that won't matter to many. M. Night Shyamalan hasn’t seemed like a director really worth following for the past 10 years. That’s presuming the general belief that Lady in the Water (2006) was his “jump the shark” moment as a filmmaker of consequence. If you think that The Village (2004) was Shyamalan’s last decent film, then it’s been even longer since he was a director who could draw an audience based largely on his name. Shyamalan sold himself as a brand, putting his name above the title, believing all the praise that dubbed him the next Alfred Hitchcock or Steven Spielberg. The storytelling twists he became known for — based largely on the surprise revelation at the end of The Sixth Sense — became a gimmick he relied upon too much. As he tried to give each of his films a big surprise, which filmgoers came to expect, Shyamalan appeared to write toward the twist, rather than just tell the best possible story, and his movies suffered for it. Critics and audiences caught on to the director trying to top himself, yet frequently stumbling as he tried too hard to be clever, to be this generation’s Rod Serling. After attempts at franchise filmmaking with The Last Airbender (2010) and even near-anonymous work for hire with Will and Jaden Smith in After Earth (2013), Shyamalan apparently hit the reset button on his career, which seemed like the right move. A name that once may have been a draw to a film became a reason to dismiss and stay away. But 2015’s The Visit looked like Shyamalan’s return to his roots, a smaller horror movie that preyed on fears many of us hold regarding visits to unknown relatives and estrangement from family. Fans and critics generally responded favorably to a creepier effort that managed to employ Shyamalan’s signature twist without building the entire story around it. Instead of trying too hard to wow and fool us, he simply made an entertaining movie. Rather than feel emboldened to make the same mistakes that seemingly sabotaged his career, Shyamalan appeared to stay in the smaller horror film lane with his latest film Split. Once again — as he has throughout his filmography, really — this story attempts to find terror in what we believe to be safe. What could presumably be safer than going to your car with friends and family following a birthday party outside a shopping center? Yet if there’s one thing that Shyamalan has continued to do, even in his movies that didn’t work, is sneak within the warm, innocent circumstances that we create for ourselves and shatter our sense of security. Dad will be back in a minute. But what if he doesn’t come back and someone else quickly takes his place, attacking you before you have a chance to respond? More than that, however, is the fear of any young woman, that someone could come along and attempt to abduct you, keeping you in a basement where no one can find you. However, Split is more than a young-women-in-danger story, though that would be enough of a horror movie for some people. Shyamalan uses that premise as a vehicle for one of his most interesting characters yet. Kevin Crumb (James McAvoy) suffers from dissociative identity disorder, displaying at least three distinct personalities while interacting with the three women he’s kidnapped. Dennis is the buttoned-up, no-nonsense warden of this makeshift prison controlled by his obsessive-compulsive disorder. Patricia is the matronly den mother who will make sure the women are not to be harmed. And then there’s Hedwig, a nine-year-old boy who enjoys taunting the captives, but is also fascinated by getting to visit three attractive females. But Kevin’s disorder goes far deeper than that. The three personalities we’ve seen belong to a group of 23 that have developed within his psyche (and McAvoy has a blast playing every one he can). Another one, Barry, is a fashion designer who keeps weekly sessions with his psychiatrist, Dr. Karen Fletcher (Betty Buckley). On the surface, Barry appears to be doing just fine, but why is he sending Fletcher emails in the middle of the night saying that he has to meet her? Fletcher attempts to keep Kevin under control with frequent therapy sessions, but while she’s trying to help, she’s also fascinated by a patient and case that could make her a pioneer in her field and open a whole new field of study. Kevin could validate several theories that Fletcher has been attempting to prove for years, that a brain like this may have tapped into a greater capacity — altering body chemistry, along with physical and intellectual gifts — than humans typically use themselves. Maybe Kevin is something beyond our normal level of understanding. Perhaps he’s an example of something almost supernatural. That is an interpretation of dissociative identity disorder which will surely irritate and outrage those who legitimately suffer from the disorder, along with those who study and treat dissociation in their patients. But Shyamalan isn’t attempting to be clinically accurate here. Kevin and his 23 personalities are intended to be an over-the-top interpretation in an exaggerated story. (Shyamalan confirms that his portrayal of Kevin’s disorder is not intended to be taken seriously with how the story progresses and in its ending, which we’ll get into later.) Anyone looking for a careful, thoughtful look at dissociative identity disorder are better served looking elsewhere. This is a horror movie, a suspense thriller, meant to unsettle and entertain audiences. 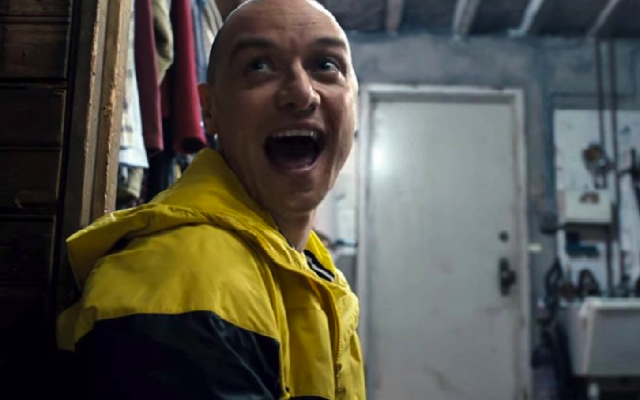 What makes Split even more intriguing than a standard horror film is that Shyamalan goes in-depth with one of the characters who’s been kidnapped. Casey (Anya Taylor-Joy, The Witch) isn’t simply a victim waiting for her opportunity to overcome her captor. She shows very early on with some surprising insight into her kidnapper’s psyche that she understands this situation more clearly she should. (Though Casey doesn’t realize at the time that she’s dealing with only one of Kevin’s many personalities.) From the outset of the film, it’s established that Casey is an outcast among her classmates and that she was invited to this birthday party out of obligation, not even out of sympathy. Something has made her withdrawn, never letting people get too close. Through flashbacks, we slowly learn various aspects about Casey that will come into play later on, such as learning how to handle a gun. As the story progresses, however, Casey’s childhood memories take a dark, disturbing turn that you might expect, as it becomes clear that her backstory is much more damaged and tragic than her older, somewhat confident demeanor may convey. Though it would hardly seem like any sort of advantage, her background and the horrible betrayal it includes lends her insight and makes her far better equipped to deal with this situation than the sheltered, pampered upbringing of her two fellow captives. If you’ve managed to avoid the big reveal about Split before seeing the movie or reading this review, congratulations. There have been a whole bunch of pieces about what’s revealed at the very end of the movie since the film’s release. Actually, considering that Shyamalan showed Split at Fantastic Fest back in September, it’s admirable that very few spoilers were posted or circulated online. I hesitate to mention anything about it myself because the reveal is a moment that every filmgoer deserves to experience without even a hint that could be a spoiler in itself. Maybe that’s something we can discuss in a separate article here at The Comeback. I will say, however, that what some people are calling a twist is probably overblown and not likely to matter to a majority of people who see this film. (The audience I saw the movie with didn’t seem to think it was a big deal.) But for some, it will be extremely rewarding and may be the difference between thinking this is a decent horror film and perhaps something more than that. I just hope you get to experience it for yourself with a pure reaction.